Every year we are planning on releasing a new and updated version of our Free Theme called the Starter Theme. We are pleased to announce that the 2012/2013 school year theme is ready to be added to your site! This new theme will also be the default starting point theme when you create a new Digital PTO Free Website. 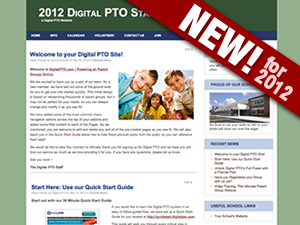 The new theme is called ‘Digital PTO 2012 Starter Theme’ and it’ll be at the top of your list of theme options. It’s super simple to try it on for size by clicking the LIVE PREVIEW link below the theme. This will open up your actual website with the new theme added for you to review. You can also play around with the color options while you’re here by clicking on the Colors tab to the left. Our 2011/2012 Starter theme came in 42 color variations, each with their own custom theme, now the 2012 Starter Theme is one single theme and the color variations are unlimited! Craft your website to the exact colors you want. It’s incredibly simple. Control the text color, the link colors, the background color, the header color, the navigation color and the sidebar colors, all with an easy to use color picker. As you can see in that short video, the color selections are limitless. In addition to the new color selection options, this 2012/2013 theme is a little cleaner and tighter than last years version. It’s not as graphics intensive, and we felt that was important considering how many families are visiting from smart phone and other slower loading devices. For those of you that are already a member of the community, you can activate your new theme at any time from here on forward if you want to use it. For those of you just arriving to our community, welcome and we hope you enjoy the new look of our 2012/2013 Theme.